Welcome to the December 2016 issue of the AXIe Newsletter. 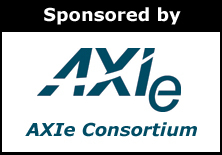 Our AXIe Consortium LinkedIn membership numbers continue to increase and we are now a community of over 341 members. I recently saw an announcement of two unusual AXIe-related products from Guzik Technical Enterprises, and took the opportunity to discuss these with Lauri Viitas, Director of Business Development at Guzik. Lauri described to me how Guzik was taking advantage of the AXIe architecture to offer the highest performance digital processing engines in the test and measurement industry, regardless of format, and the applications this would enable. The conversation also highlighted how difficult it would be to bring this processor, and its scalability, to any format other than AXIe. If you are unfamiliar with Guzik, they are a supplier of disk drive test equipment and, more recently, high-performance AXIe digitizers and processing module. I previously covered an astrochemistry application, based on AXIe, to investigate sources of life in the cosmos. The researcher, Dr. Shipman, needed a 1000x increase in measurement speed. Guzik’s digitizers, with embedded onboard FPGAs for processing, were critical to meeting the speed requirement. Dr. Shipman also used an AXIe arbitrary waveform generator from Keysight Technologies. This column, Test Cafe, seeks to provide architectural and business insight on topics related to electronic testing, with a particular focus on modular instrumentation. I’ve been pretty bullish on the future of modular instruments, such as PXI and AXIe. I’ve predicted that they will continue to take share in the test industry due to numerous dynamics. But predicting where, how, and why requires insight into why users buy test equipment at all. This is actually a common question I’m asked in my day job as an industry consultant. And if I’m not asked, I often bring it up. What are the business drivers of the end user that compels them to spend billions of dollars of their hard earned money each year on test equipment? And from that, what are the key differentiators that determine when they might buy from vendor A or vendor B, or instrument format X versus instrument format Y? We’re all engineers, so we know the devil is in the details. But, with the right segmentation models, we can see some patterns emerge. A mentor once told me, “All segmentation models are flawed. Some are useful.” With that as a caveat, let me show you a model I use to segment the test and measurement industry. Data transmission in devices, interfaces and networks are becoming faster and more complex as billions of devices join internet connections for data mining and remote control. New technologies such as coherent optical transmissions and PAM-4 Ethernet are providing paths to a future with even faster data transmissions. In addition to the benefits of fast data transmission, comes the challenge for design and test engineers who must ensure data connections are fast, accurate and robust against signal distortions and link impairments. This article describes the advantages of emerging data transmission technologies and the use of arbitrary waveform generation to achieve versatile signal creation for digital applications in optical and electrical communications.